The Facial Detox Purifying Recovery Mask is a product of a Dutch specialized skincare company named MUDMASKY®. As most of you know by now, I was born in Rotterdam, The Netherlands and I travel at least twice a year from sunny California to Rotterdam (The Netherlands) to visit my family. Last month I discovered a new natural mud mask named MUDMASKY® at my favorite spa in Rotterdam, so I decided to buy one. 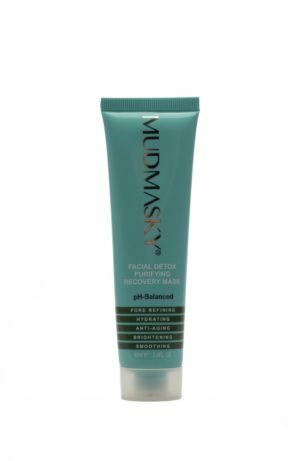 MUDMASKY® claims that the Facial Detox Purifying Recovery Mask helps you to achieve the perfect pH (more about the pH later) for your facial skin. Mudmasky says this is an all-in-one facial mask (because it’s pore refining, hydrating, anti-aging, brightening and smoothing) and it’s suitable for any skin-type, but not recommended for extreme dry skin. The packaging of the tube is simple, but original. Mudmasky uses a new kind of airless tube which is not only great to keep antioxidants stable, but also very hygienic compared to jar packaging. It seems that MUDMASKY® is very proud about there natural ingredients, because they have dedicated approximately one third of there website to the ingredients. Customers nowadays become more and more aware about the products they buy, so we think this is a smart move for a company that has nothing to hide. But, having natural ingredients doesn’t necessarily means that a product is good. Some allergic reaction are caused by natural skin-care ingredients. Looking closely at the ingredients we see this isn’t the case with the Facial Detox Purifying Recovery Mask, we must admit that we are highly impressed about the ingredients. It doesn’t contain parabens or other ingredients that might harm your skin. The first thing we noticed applying the Facial Detox Purifying Recovery Mask that it has a very nice light texture. It doesn’t have the “heavy mud texture” like most mud masks. The mask has a natural teaish-like smell which isn’t too strong. After applying the mask on my face I’ll noticed a very light tingling feeling (after 2 or 3 minutes) and I could even feel my face getting cleaned somehow, an experience which I never had before. I started to feel more exited every minute I was wearing the mask. The Facial Detox Purifying Recovery Mask is amazing. It’s the best product we have reviewed since we started this blog almost 2 years ago. It’s the only product that does everything it claims what is also unique. Pores are less noticeable. We also love the fact that they stay less noticeable for days! Mudmasky did a great job not covering the problem up with cheap fillers, but with good natural cleansers like French Green Clay and Wyoming Clay. Most mud masks dry your skin completely out, this one doesn’t. The Betaine and Maroccan Lava Clay makes shure that your skins natural moist doesn’t get off balance. Your skin feels much softer after one use. Fine lines between your eyebrows is the first thing I personally noticed, they seemed less noticeable after 3 weeks (applied 5 times). We also love the fact that Mudmasky is being honest that a healthy lifestyle is more important than any skincare product. MUDMASKY’s most important claim is that this mask is pH-balanced. We have done a test, and we where really amazed that even this was true! After using this mask our skins pH-level was between 5.43 and 5.81. This is the perfect pH-level! Since we are so strict we also want to share the downsides. First thing is the price, with a whopping € 69,- (about $ 80 USD,-) it isn’t cheap. But since you just need to apply a thin layer and it’s recommended to use once a week, it will last a while. I managed to get out 12 home-facials, which is about $ 6,50 ,- USD a facial, which is over 10 times cheaper than visiting my favorite spa. Second thing is the estimated shipping time to the US; It’s 14 business days which is quite long compared to most competitors (however shipping is free). And last: Rinsing the mask off isn’t that easy as applying it. It takes a bit of an hassle to rinse it completely off. Almost amazing how simple a good skincare product can be. MUDMASKY® is being completely honest about not using so-called “revolutionizing technologies” or other marketing terms. They just use good premium natural ingredients. The combination of the 3 clays and the fact that it’s pH-Balanced makes it an unique skincare product. We would recommend this product to anyone who is looking for the best facial mud mask and doesn’t mind to pay a little extra. + Best Skincare product so far! After reading a lot of Mudmasky reviews, I have finally bought one and it’s amazing! My skin looks so much better after 2 weeks. Really worth the price. I used the product and its amazing. I am looking better after 15 days. Very good product. Does this work for men too? It DOES work for men too! The Facial Detox Mask is the best thing ever!